Since the beginning of time, mankind has sought fish as a food source. To most, catching fish was simply a means to an end...food for the family. To some, the pursuit was the awakening of an instinct that drew them to the water in search of the thrill of the "tap, tap" - something only a true fisherman really understands. This website is dedicated to those kindred spirits who have an inborn desire for fishing and seek knowledge about the science and sport of fishing. Bass fishing. Learn how to locate and catch largemouth, smallmouth, spotted, redeye and shoal bass. Fishing for catfish. Find ways to catch big blue, white, channel and flathead catfish. Crappie fishing. Learn tips for locating black and white crappies - plus tricks for catching them. Walleye fishing. Look into the world of these toothy critters. This tasty fish is found in cool, clear water. Panfish fishing. Learn to catch bluegill, warmouths, redears, fliers, perch, white bass and other sunfish. Trout Fishing. Locate and catch rainbow, brown, cutthroat, brook and lake trout. Salmon fishing. Atlantic, coho, chum, chinook, pink and sockeye salmon reside in both salt and fresh water. Striped bass fishing. Stripers grow to over 60 pounds and often migrate in large schools. Steelhead fishing. Steelhead are rainbow trout that venture from fresh water into the ocean. Fishing for other species. Muskie, pike, sturgeon, gar and others are listed by state. The information in this site is organized by subject, state and species. From this home page you can access a general fishing overview page for each state with links to categories of information. Access specific species information at the top of this page. Locate information by subject using the upper portion of navigation. Access the home page for each state using the state navigation below. The fishing videos section offers a selection of topics with videos covering a variety of fishing information. We offer an excellent bass fishing book for sale sharing years of experience to benefit new and experienced bass anglers alike. The home page for each state offers links to state-specific information both by subject and by species. Also listed are the major fishing waters located in the state and connections to other information specifically relevant to fishing in that state. Topic-specific pages within a given state will offer connections to other state pages offering similar information on that subject. If you visit the Arizona bass fishing page page, it will contain links to all other Arizona pages, as well as links to bass fishing pages for all other states. Visit the camping section for information about camping nearby fishing waters, in your area. Most camping facilities offer spaces for a motorhome or RV and a place to park your fishing boat. Fishing lures, fish finders and GPS navigation information is available through the navigation on the main menu pages. 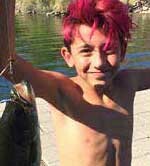 Also find information about taking kids fishing and local urban lakes, listed by state. There are ten major lakes in Mexico commonly fished by Americans in the central and northern regions of Mexico. If you have an interest in Bass fishing in Mexico, please visit the Mexico bass lakes map page. Also review the information we are gathering on Agua Milpa, Angostura, Baccarac, Comedero, El Cuchillo, El Salto, Guerrero, Huites, Mateos, Novillo and Obregon Lake (lake Oviachic). This site is intended to be the collective works of many anglers who wish to share their fishing knowledge. If you would like to contribute, visit the contact us page for information on how to submit. Visit our sister sites with information about camping or boats and boating information in all fifty states. Also visit Rocky Point Mexico for deep sea fishing in this quaint vacation paradise on the Sea of Cortez. Fishing for bass, catfish, crappie, walleye, trout and other fish - with a special focus on lake fishing. Learn the latest techniques and secrets for all aspects of fishing. Learn how to approach fishing at a new lake. If you belong to a fishing club or organization we would like to list it for the benefit of our visitors. We also list fishing guide services and fishing organizations. Visit our Contact Us page to submit your information. Enjoy the fishing, share the knowledge and protect our fisheries.